Cardiology Database: Mitral valve . . . Where did this name come from? Mitral valve . . . Where did this name come from? Have you asked yourself this question. Why the left atrioventricular valve (or the bicuspid valve as some old books say) is commonly known as the mitral valve. In fact the name mitral is now the most commonly use name and it may sound strange somewhat if you use any either of the other 2 forementioned names. Then what does mitral mean. 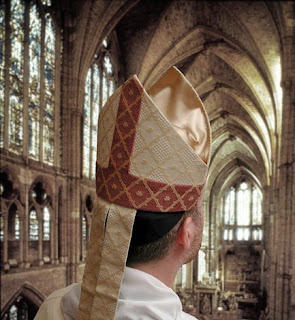 The word "mitre" is used to name the hat worn by catholic bishops and cardinals in ceremonies. Here is some mitre. When you turn the open mitral valve upsidedown you will find it looking like the mitre. They say a picture worth 1000 word, so let us save the words. Here is the piture. Realy, so gooto know the cause of names.